You’ve heard it before, but it’s worth repeating. Mobile devices are increasingly dominant. That’s been apparent for a few years now. 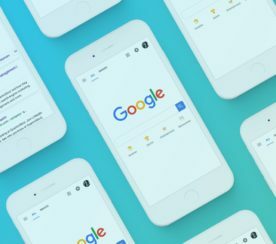 Google made it crystal clear in January by announcing that mobile page speed would become an official ranking signal later in the year. As of July, if your webpages take too long to load on mobile, you may see diminished organic search performance. 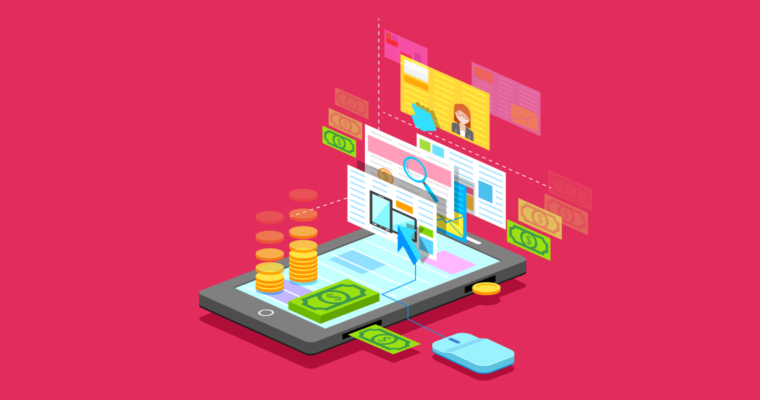 The push for better mobile user experience (UX) applies to paid search, too. The Mobile Landing Page Speed Score, now integrated into the Google Ads interface, scores your landing page on a scale from 1 (wow, that’s slow) to 10 (almost too fast). Translation: subpar mobile landing pages may hurt your quality scores and bump up your CPCs. Whether your focus as a search marketer is on the organic side or the paid side, take notice — it’s crucial that you improve UX for desktop and mobile users alike. 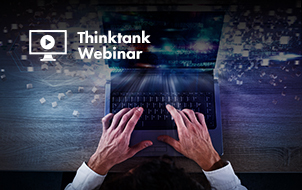 For starters, mobile accounts for 52 percent of global Internet traffic. More often than not, users turn to their smartphones – rather than their laptops – to surf the web. From Google’s perspective, delivering an excellent search engine experience means delivering an excellent mobile search experience. 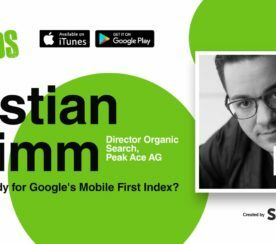 Making mobile page speed a ranking signal and launching the Mobile Landing Page Speed Score are clear incentives for SEO professionals and PPC marketers alike to focus on smartphones. 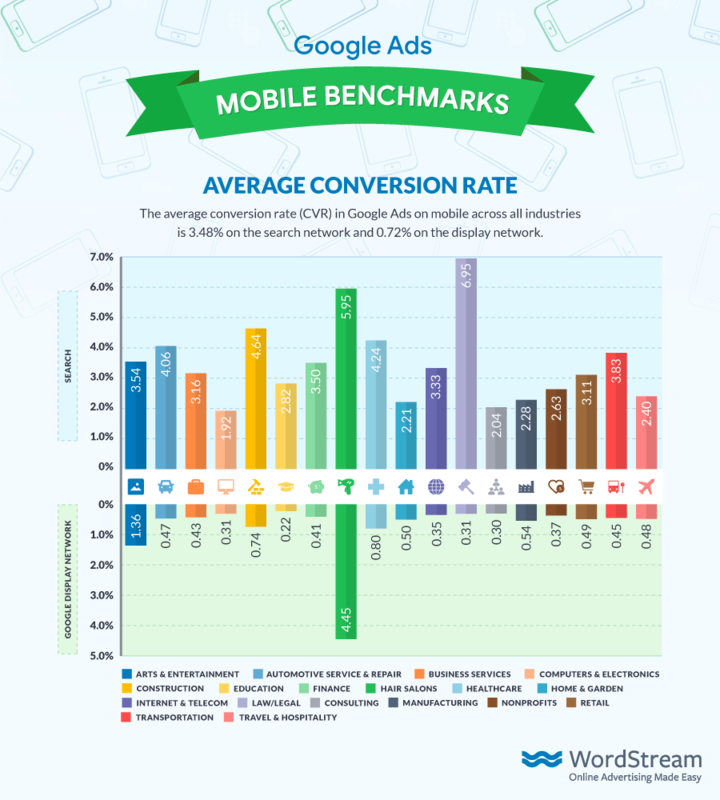 As such, WordStream (disclosure: I work for the company) figured you guys may want to know how you stack up against industry competitors when it comes to mobile ad performance. 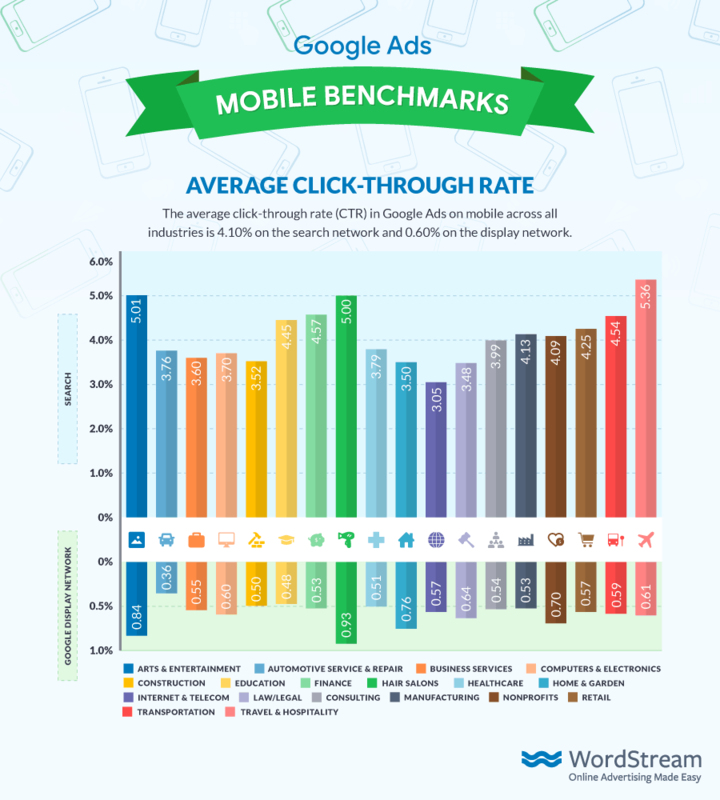 Mobile click-through rate (CTR) for both search and display ads. 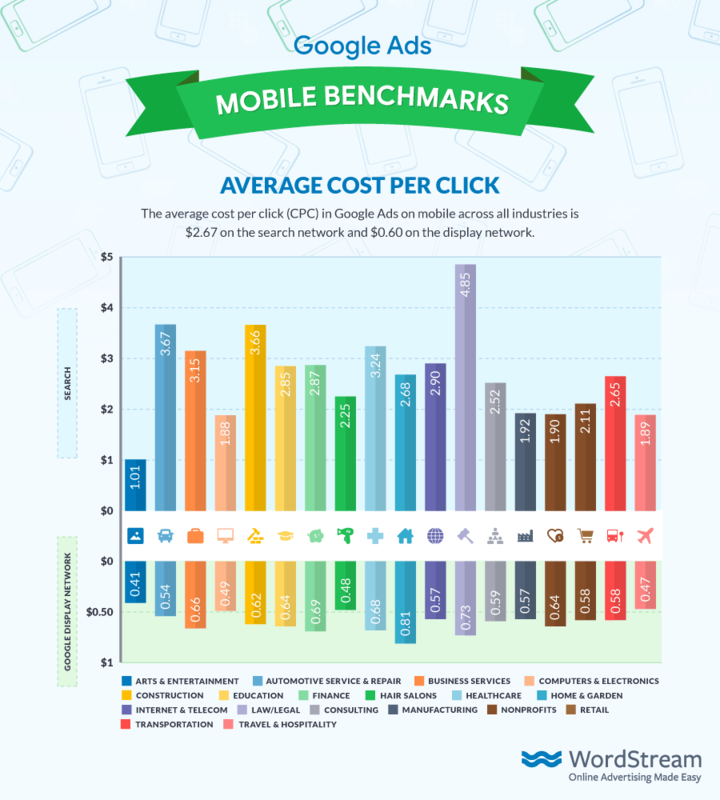 Mobile cost per click (CPC) for both search and display ads. Mobile conversion rate (CVR) for both search and display ads. Mobile cost per action (CPA) for both search and display ads. Travel & Hospitality advertisers are top dogs when it comes to mobile CTR on the search network, coming in at a cool 5.36 percent. Interesting note: when we looked at CTR across mobile and desktop, Travel & Hospitality advertisers clocked an average of 4.68 percent. Evidently, when consumers are on the hunt for flights and hotels, they’re more likely to click when surfing on their smartphones. On display, hair salons and arts & entertainment companies do even better than travel. Meanwhile, internet & telecom advertisers have the lowest CTR’s on average. For all advertisers, the average mobile search CTR is 4.10 percent and the average mobile display CTR is 0.60 percent. We weren’t terribly surprised to see that Law/Legal advertisers drive the highest costs per click (CPC) on the mobile search network. Acquiring a single client for your law firm isn’t like selling a single pair of sneakers; it’s competitive, the clients are high-value, and that translates into very high keyword bids. When it comes to those on the lower end of the cost spectrum, Travel & Hospitality advertisers keep their hot streak going. Apparently, those high CTRs are helping keep down CPCs, especially on the display network. This isn’t shocking, either — images of luxury resorts and gorgeous beaches make for effective banner ads. 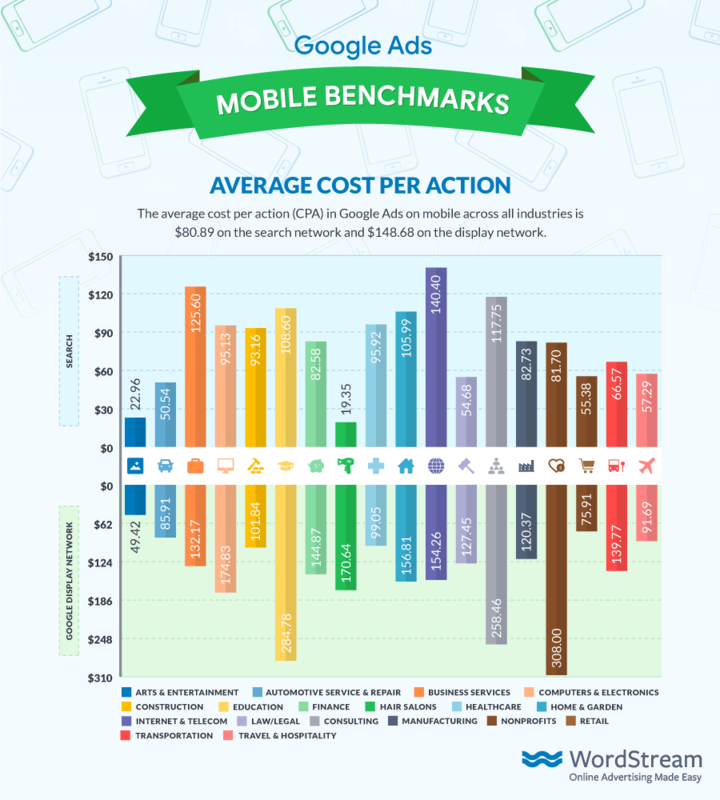 For all advertisers, the average mobile search CPC is $2.67 and the average mobile display CPC is $0.60. 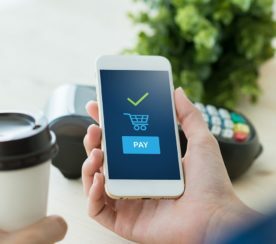 Without a doubt, one of the most impressive findings to come out of this study is that Hair Salon advertisers drive mobile display conversions at a rate of 4.45 percent. That’s over six times the average! Plus, as shown in the graph, advertisers in only one other industry — Arts & Entertainment — drive conversions on the mobile display network at a rate above 1 percent. The biggest takeaway from mobile search conversions is that Law/Legal advertisers are getting their money’s worth with those crazy high CPCs. A CVR of nearly 7 percent is pretty amazing. 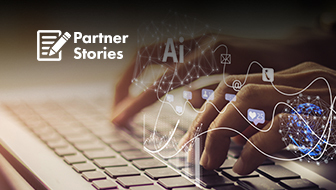 These PPC success stories aren’t the norm, however. Take a look at Education advertisers, for example. Their mobile display CVR of 0.22 percent is the lowest out of all 18 industries. Their mobile search CVR, 2.82 percent, is definitely an improvement, but not anything impressive. The difficulty of advertising higher education through banner creative — on top of an interminable sales cycle — certainly doesn’t help. 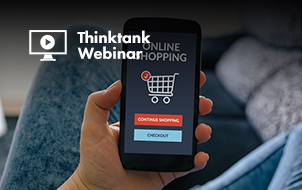 For all advertisers, the average mobile search CVR is 3.48 percent and the average mobile display CVR is 0.72 percent. We typically expect low CTRs to correlate with high CPCs. Similarly, low CVRs tend to yield high CPAs. The harsh truth about advertising on the display network: banner creative works a lot better for some industries than it does for others. It’s unsurprising to see that Arts & Entertainment advertisers and Retail advertisers boast low mobile display CPAs — what they’re selling is somewhat easily translated into visual images. On the other end of the spectrum, sky-high CPAs for advertisers in the Education and Nonprofit sectors are equally unsurprising. How does one turn concepts like knowledge and activism into effective, engaging banner ads? For all advertisers, the average mobile search CPA is $80.89 and the average mobile display CPA is $148.68. 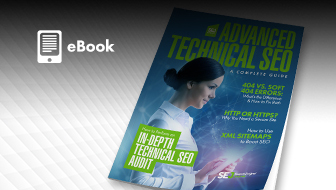 This report is based on a sample of 20,297 U.S.-based WordStream client accounts who were advertising on the Google Search and Display networks during the 2017 calendar year. Each industry includes at least 35 unique, active clients. “Averages” are technically medians to account for outliers. Conor Bond is a Content Marketing Associate at WordStream and a frequent contributor to the WordStream blog.